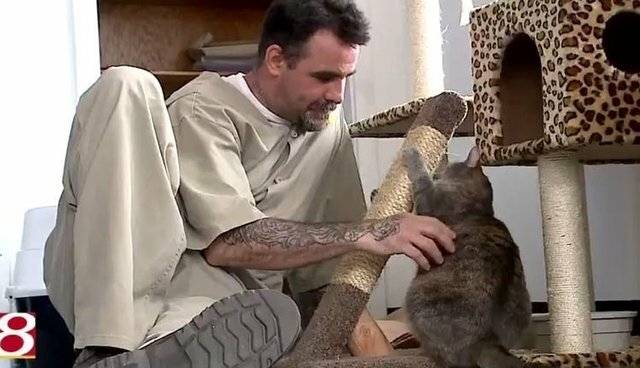 Within the walls of a maximum security prison, behind gates and locked doors, something amazing is happening - a new program is helping shelter cats and inmates get a second chance and learn to love. A partnership between the Pendleton Correctional Facility and the Animal Protection League in Anderson, Indiana, brings shelter cats to live in a sanctuary within the prison, where they are cared for by inmates. The cats are free to roam their playground, housed in an old office, where they play with toys and on jungle gyms crafted by the men at Pendleton. The men who care for the cats recognize the importance of giving the animals a chance to leave their cages in the shelter. "I deserve to be in prison; I committed a crime," Barry Matlock, one of the inmates, told local outlet WISH. "But these animals, they live like we live in the cell houses in the cages, and they don't deserve that." 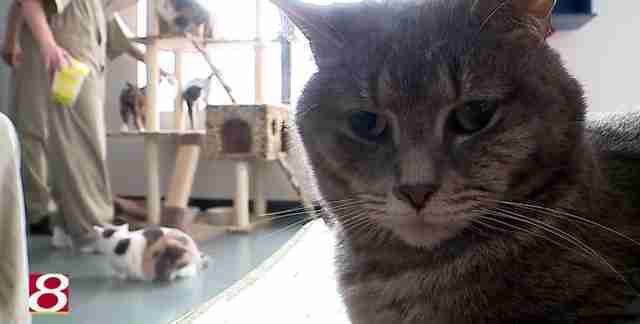 The program, which is supported entirely by donations, aims to help the shelter cats by giving them a chance to get lots of playtime and affection while they're waiting for forever homes, but it helps the inmates just as much. "Love will change the characteristics from anybody's tortured past; it goes the same for animals and humans really," Lamar Hall, one of the inmates, told WISH. This partnership isn't the only program that brings rescue pets together with inmates, and such opportunities are movingly beneficial for the animals and the humans involved. "It instills a little bit of humanity back into me, because I've been locked up for over seven years," Matlock said. "These animals, they help bring that [humanity] back out."